LIFE IS LIKE thin sheets of seawater sweeping up across the beach then sliding back into the ocean, leaving behind a few gasping bubbles and a handful of sand crabs scurrying around in search of something not visible. You see the damp beach, then it disappears behind a veiling reflection of sky and clouds. Here one moment, gone the next. Oh, do I wish my mother’s ashes could speak. 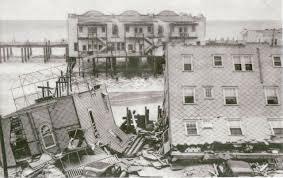 Perhaps they could tell me why we were not swept out to sea during the 1944 hurricane that furiousy pounded Wildwood, New Jersey. Somehow, miraculously, my mother Lydia, my brother ‘Hilly’, and I survived while countless others perished. I think it was the first time I experienced my mother as a woman separate from me, separate from my needs and wants, a woman vulnerable and afraid just like I was. I wish I could ask her why we survived, why we weren’t sucked into the sea like all the others. What could she tell me of those terrifying hours? I want to go back to Wildwood and experience it all again, but with the assurance, of course, that the outcome would not be changed by some malevolent writer of fiction invisible above the fury of those unforgettable, cyclonic clouds. World War II was winding down that year, and my mother had taken my brother and me to Wildwood, a seaside resort roughly halfway between Atlantic City and Cape May, for a week of vacation. My father, a private and inaccessible man, remained in Philadelphia attending to his law practice, and attending I presume to the skirts that fluttered on the streets of Center City. I guess he was happy to have some time alone, away from the family. He liked being alone, sitting in the sunroom, his pants open at the waist, the New York Times tented over his basketball belly, Beethoven on the radio, asleep, alone, unconnected to the living. I think it was already late afternoon when the cab carried us through the hot humid summer air back to the small, second floor apartment Mom had rented on the second floor of a beachfront cottage. A cab would seem an unlikely mode of transport given what I presume my father’s income was back then, but perhaps news of a storm was beginning to spread, and people spent what they needed to seek shelter. As we got out of the cab, enormous raindrops, the size of sand dollars, suddenly fell from the sky and hit the concrete pavement with splats as loud as machine gun fire. We dashed to the steps and into the security of our apartment, which consisted primarlily of a single room with windows on three sides that faced the ocean. There were some closet-sized bedrooms that faced west, back toward the bay. The wind was starting to whip up and the ocean looked troubled. Swells started far out near the horizon and rolled in like lines of tanks arriving for battle. The sun was eclipsed from view by clouds marauding across the sky. It was as if a war-machine of nature had been sent to our shores from the man-made war between nations on the far side of the Atlantic. The stream of retreating bathers had cleared the beaches within minutes of the arrival of that bizarre rain shower and the narrow street next to the house was now empty. The rain suddenly vanished, swept aside for the moment by buffeting winds. I noticed a car drive up alongside the house and park no more than thirty feet from the roughly five-foot high sea wall that protected our house. A thin man wearing a white dress shirt, black tie and a light weight black business jacket hopped out with a bulky press camera swinging from one arm. He positioned himself with feet firmly on the macadam to take pictures of the angry sky and the wild ocean. Waves repeatedly exploded in green-white fans as the sea smashed against the sea wall. He turned as water splashed over him and swirled forcefully in treacherous pools around his legs, soaking his pants all the way to his belt. He kept shooting, trying to protect his gear, slipping photographic plates from his jacket pocket into and out of the rear of the camera. My mother opened one of the windows that formed a continuous band around this fragile summer room and screamed into the howling wind, imploring the man to leave. Even at five years of age, I was proud of her concern for the welfare of of this stranger but felt she was a tad premature in expressing her concern. I can still hear the desperation in her voice as she alerted him to the mounting danger more visible from our elevated vantage point than from his. After a huge plume of seawater suddenly shot up over the wall, the man jumped back into his black car barely escaping a mountainous wave that could have done him in. We watched the ocean grow more violent as huge waves slammed into the sea wall and crashed thirty feet over our house. I think my brother and I would have been really frightened if we actually understood the peril that was descending upon us. I wish Mom’s ashes could speak to me today and tell me how scared we really were. The house shook as the ocean’s mountainous waves relentlessly pummeled the house, driven by 90 mile an hour winds. The owner of the house lived alone on the first floor. She came up the back steps to confer with my mother from time to time with a terribly frightened look on her face. It was agreed she would stand on a table periodically and bang on the ceiling to let us know she was still all right. We could hear her below us during a lull as she pushed furniture against the door that faced the ocean and what was left of the weakening sea wall. Then the ocean would surge again and crash open the door and slam her and the furniture to the rear of the room in a grinding screech. Outside of our water and sand-streaked windows the ocean and the sky had fused into a ferocious cauldron of cyclonic energy, gray and furious, whirling and battering, and in a state of unspeakable fury. I had packed a green periscope-shaped flashlight. I fetched it from my carry bag and pressed the aluminum button to send flashing signals into the darkness that surrounded us. I was five years old at the time, my brother seven, and my mother in her lovely thirties. If she had been terrified, I cannot recall, and knowing her, she would have tried to conceal it from us even as she bit her lower lip. Perhaps all of us were lulled into believing that the house would somehow protect us against the immeasurable fury of nature. That’s what a house is supposed to do, isn’t it; protect! 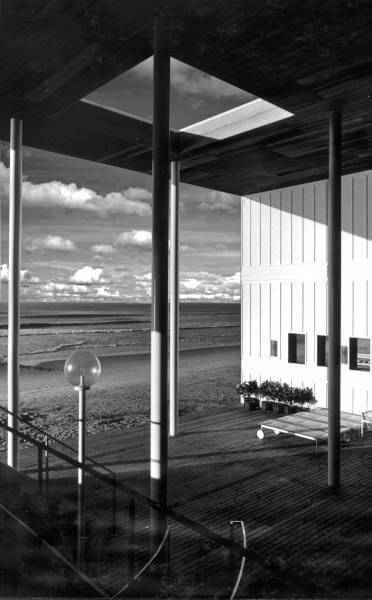 Although our bungalow was anchored deep into the sand through its wood pilings, the building shuddered and groaned with each onslaught of waves. I must have been scared because at some point my mother said, Joel, look out the windows to the left. When you see that house go, then you can be scared. The words were not fully out of her mouth when the house imploded and was sucked down into the raging waves of the sea. We could not hear the explosion or implosion, or the cries from anyone trapped within, so deafening was the sound of the howling winds. Come back, Mom, and tell me what happened next. Were we all crying on the floor, or praying? Certainly not praying! Mom’s father read Bertrand Russell and subscribed to Russell’s brand of atheism, as did my mother, and as do I. In full disclosure, she was an atheist until her dying day’s fifty some years later when she decided to hedge her bets and accept that there might be a god out there somewhere. If there was a god out there in that hurricane of 1944, he must abandoned his watch, or momentarily lost control of the nature he was supposed to have created. I would love to know more about what we were all thinking, and feeling, or saying, or fearing to say in those moments when our lives were hanging in a terrifyingly precarious balance. I think we must have slept for a while (I can’t imagine how) because my next memory is that of a sunny sky and a peaceful ocean, as if the hours of dark and untamable madness had been but a dream. Up and down the beach we could see only a handful of isolated houses, porches torn off, windows blown out, where before there was a solid line of houses that curved along the coast in both directions. It was a scene of such total devastation that it is impossible to erase from my memory. Did my brother and I realize that hundreds of lives were washed into the sea along with the countless houses. It didn’t register then, at least for me; it surely does now. To this day I still grow fearful when the wind howls. Our cottage was now standing stood in the middle of the sea, as if this were perfectly normal, and we should go about enjoying the day as if we were on a fishing boat. Our landlady, who had come upstairs with us sometime during the night, was inconsolable. Eventually two men in yellow raingear rowed a lifeguard boat up alongside the house. One man steadied the rolling boat as the other man struggled to muscle a ladder in our direction as we stood in the still strong winds on a now cantilevered second-story stair landing to which our outside stairs had once been affixed. The four of us huddled on this precarious ‘balcony’ afraid to descend the swaying ladder into the arms of a stranger no matter how strong and tan he looked. One of the men carried me down first, then Hilly. Then he went up for my mother, her sundress fluttering in the breeze, that irrepressibly flirtatious smile beaming on her face, but her heart no doubt skipping wildly with pent-up anxiety. Our landlady was now alone on the balcony and she wailed and covered her face in embarrassment, in grief, and in unfathomable sorrow. She initially refused to let her chubby body be carried down and away from everything that had been the center of her life for decades. Hilly remembers that we were rowed to a stretch of visible road from which we could walk to a bus terminal or a train station. Far in the distance we saw a tiny dot seeming to move toward us. The dot loomed larger and then we realized it was a man racing toward us along the broken roadway. He raced past and through huge empty pools of seawater with building pieces floating like rafts. We saw a kitchen table top that amazingly still held a plate with a slice of pizza seemingly glued to it. When we finally realized who it was in his white linen suit and straw hat, wearing his fancy lawyer shoes, we raced toward him. His face was white, nose a bit red, tears filling his weary small eyes. Hearing of the hurricane, he boarded the first train he could get with no assurance we were still alive, probably already steeling himself for what he must have presumed was the inevitable news that we had been washed out to sea like the others and taken back to the watery womb that had brought forth all of nature several billions years earlier. A believer in the god of his Jewish faith, he must have thanked God for the miracle he was now hugging with all his might, fearing the worst and wondering all the time whether he was still dreaming.